The simple design makes for cost-effectiveness. The individual adjustment of torque and speed allows for space-saving installation of our helical-worm gear units. Use the S series gear units to implement simple tasks in your machine or plant applications. The combination with a helical gear stage significantly increases the efficiency compared to pure helical-worm gear units. The linear power transmission makes the helical-worm gear units especially quiet in operation. Why? 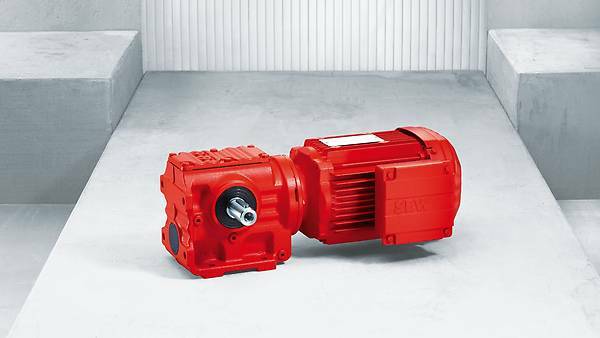 Power is transmitted via the worm shaft and the worm gear to the drive shaft. This dampens the torque impulses and reduces the noise. The torque ranges from 92 Nm to 4,000 Nm. Only half the solution without a motor? Then use our modular concept and combine the gear units of the S series with an AC motor to an S..DR.. helical-worm gearmotor, or with a servomotor to an S..CMP servo helical-worm gearmotor of your choice. Or simply choose the separate AC motor or servomotor that meets your requirements.